The longtime simmering feud between Podemos party co-founders Íñigo Errejón and Pablo Iglesias over electoral strategies and political alliances erupted into crisis for the five-year-old party last weekend, with Errejón’s announcement that he was joining forces with Madrid Mayor Manuel Carmena to lead the independent Más Madrid electoral coalition ticket in regional elections scheduled for May. 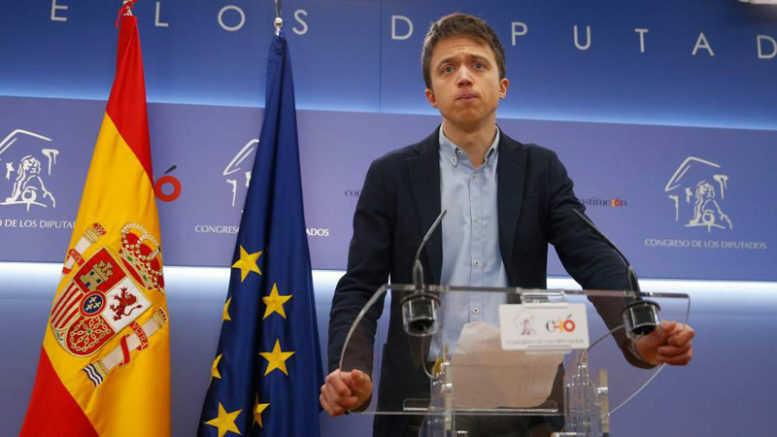 Errejón was already the candidate for the Unidos Podemos list in the upcoming regional elections, having won 98 percent of the vote in Podemos Madrid internal primary elections last May. On announcing he would lead the Más Madrid ticket in order to try to extend Carmena’s independent Más Madrid movement to the larger Madrid regional community, Errejón said he hoped that Unidos Podemos would support the new platform in order to present a united leftwing front at the regional level. But his joint announcement with Carmena registered surprise and anger among Podemos party leadership, prompting party co-founder Pablo Iglesias to issue his own immediate announcement via video saying the party would not back Errejón and would find another candidate to run against him. Following a stream of denunciations at the weekend by Podemos leaders, on Monday Errejón resigned his seat as a Podemos deputy in the national Congress in order to focus, he said, on the upcoming regional campaign for Más Madrid. He also said that as a cofounder of the party he would not resign his membership and still considered himself a rank-and-file militante of Podemos. Madrid Mayor Manuela Carmena was elected as an independent in May 2015 on the broad-based Ahora Madrid ticket, which was supported at the time by Podemos, whose candidates were incorporated into the coalition and served in various positions in Carmena’s municipal government. In September, she announced she would stand for re-election in upcoming municipal elections in May, but that in place of Ahora Madrid she would form a new, non-partisan electoral platform (Más Madrid) that would include independents and individual members of all parties on the progressive left in Madrid. When all six current Madrid city councilors for Podemos, including the current spokesperson for Madrid’s city government, Rita Maestre, announced in November that they intended to join the Carmena ticket rather than standing in internal Podemos primaries, the party leadership suspended their membership.